This is the essential Music Together® class, one that a child can attend from birth through age four through all nine song collections. Early childhood educators consistently recommend mixed-age groupings as an optimal learning environment for children under five years. In this setting, older children learn from being in a leadership role (a role they may not take when they're in a group of their peers), and younger children benefit from the example of an older child. Classes have a family feel, rather than a school orientation, an environment your child will have ample opportunity to experience when he enters the world of formal education in a few years. In addition, children of the same age are not necessarily in the same stage of music development and a mixed-age environment creates a space for exploration and discovery, rather than peer pressure. 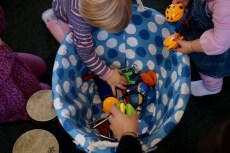 The Music Together curriculum is designed to teach on many levels of complexity at once, and Music Together teachers are trained in the art of mixed-age learning.